A flavored mayonnaise, originating from Provence in southern France, that is heavily seasoned with garlic. It is served to complement meat such as beef or poultry (chicken, grouse, turkey), fish (salted or fresh cod, mullet, grilled salmon, baked bass) and vegetable dishes (beets, steamed vegetables, potatoes). 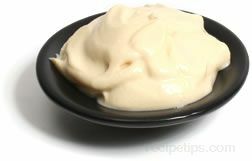 In addition its use as a sauce for foods, aioli has many other uses in main dishes. It may be used as a base for fish stock, thinning it out with the stock and then serving it as a topping that is drizzled over the baked fish to make Bourride, a fish soup. Another version uses aioli as a dipping sauce to be served with a platter of boiled or fresh vegetables, fish, shellfish, beef, and/or chicken to make Aïoli garni that is commonly served in France for Christmas eve celebrations or on Friday evening gatherings. Aïoli Monstre which may also be referred to as Le Grande Aïoli, is a dish that uses ailoi combined with eggs, fish, boiled meats, chicken, and chick peas. Considered to be the "butter of Provence" aioli has many uses and is a common condiment, sauce, and cooking ingredient, much like butter for many recipes.